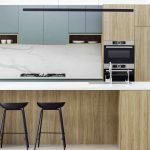 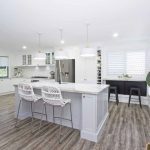 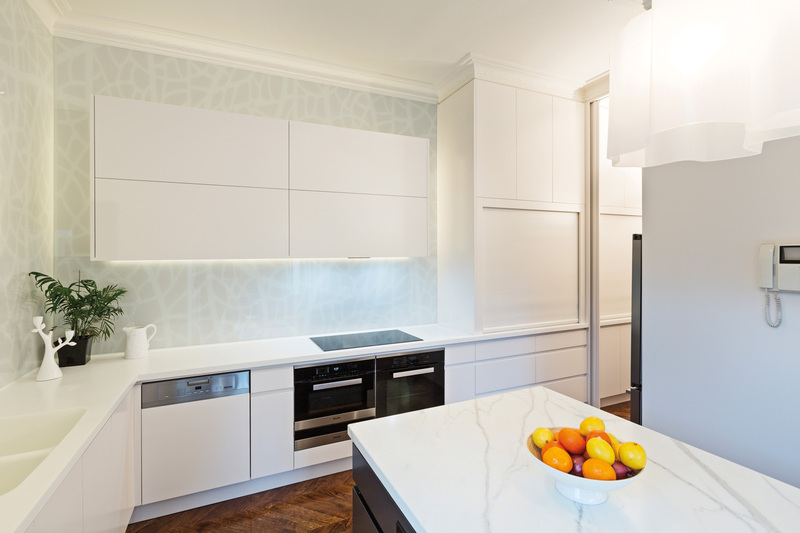 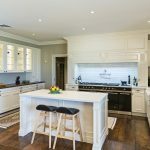 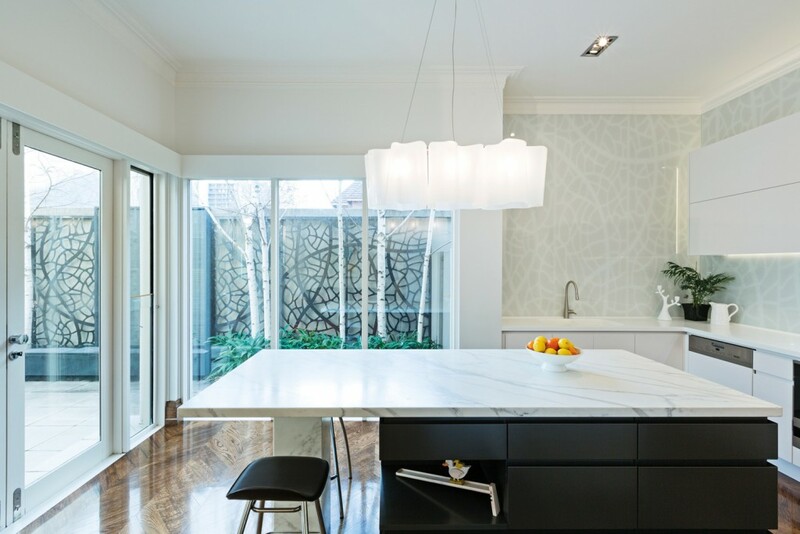 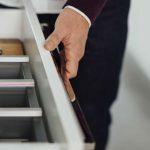 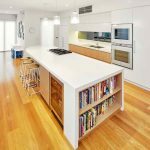 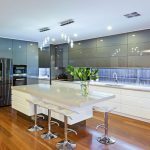 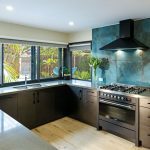 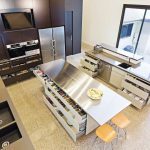 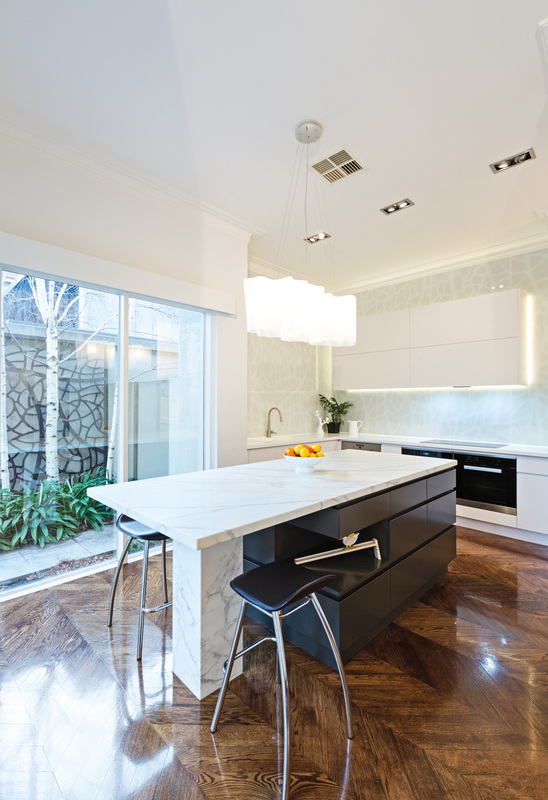 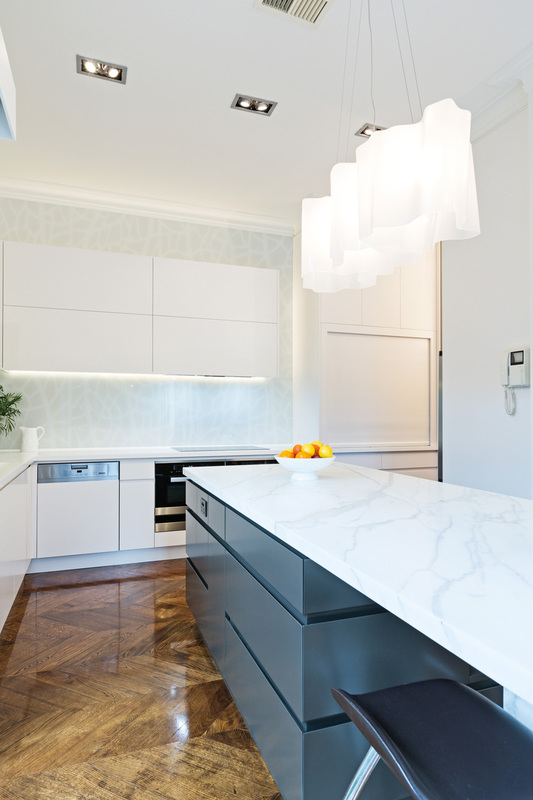 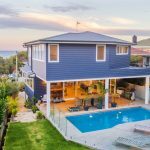 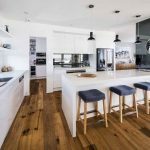 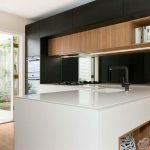 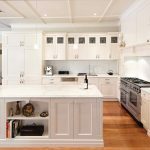 “The clients wanted a fresh look for their kitchen, together with a few good design elements — a far cry from their existing kitchen. 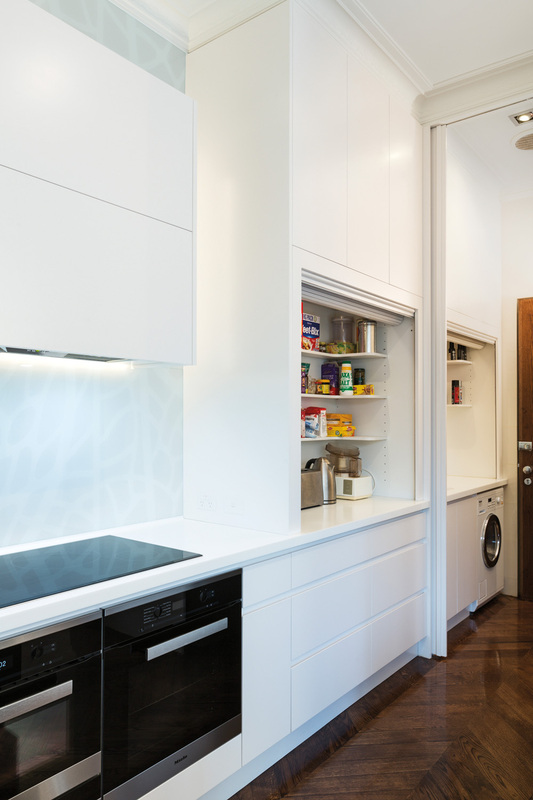 We also had to consider a separate laundry, as the clients wanted the laundry design to flow easily with that of the kitchen. 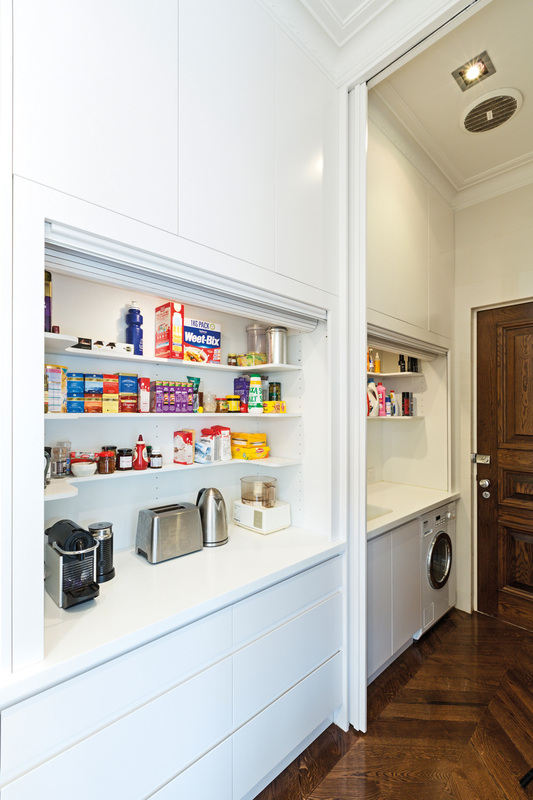 The laundry wall was removed so we had the freedom to recreate the space, and we used sliding doors with the same two-pack satin finish used in the kitchen to separate the two rooms when shut or let them flow when opened, thus creating the look of a larger kitchen. 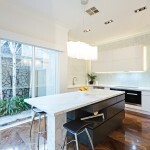 In the kitchen space, we moved the sink out of the island to declutter the island benchtop. 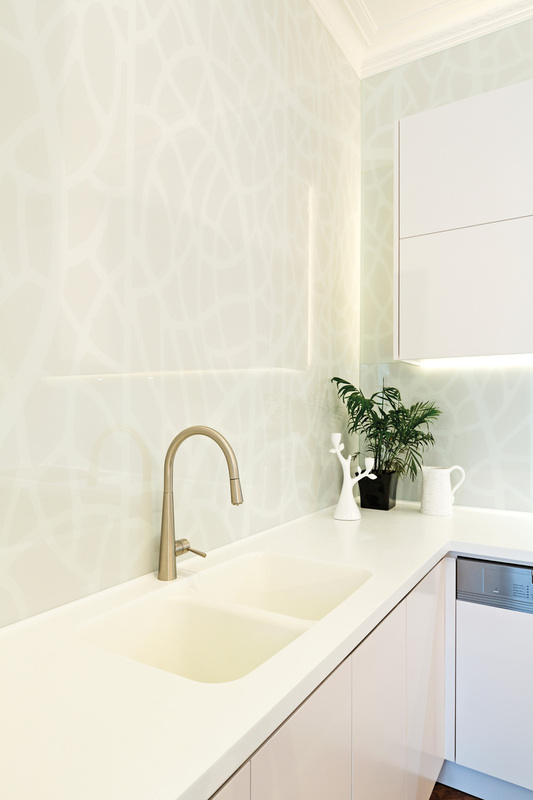 As part of the design, we took photos of the outside feature screens, resized them and adjusted the colour, and had the pattern printed on glass panels. 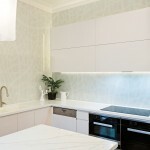 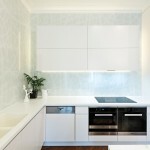 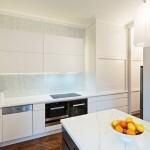 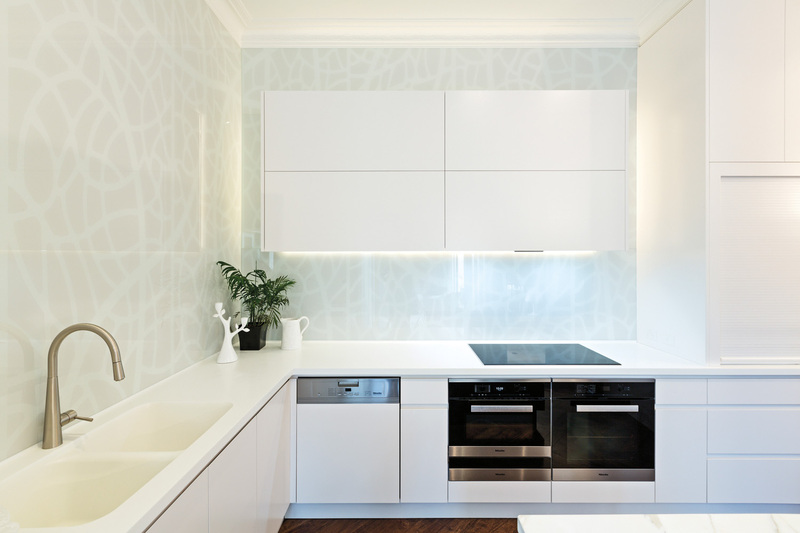 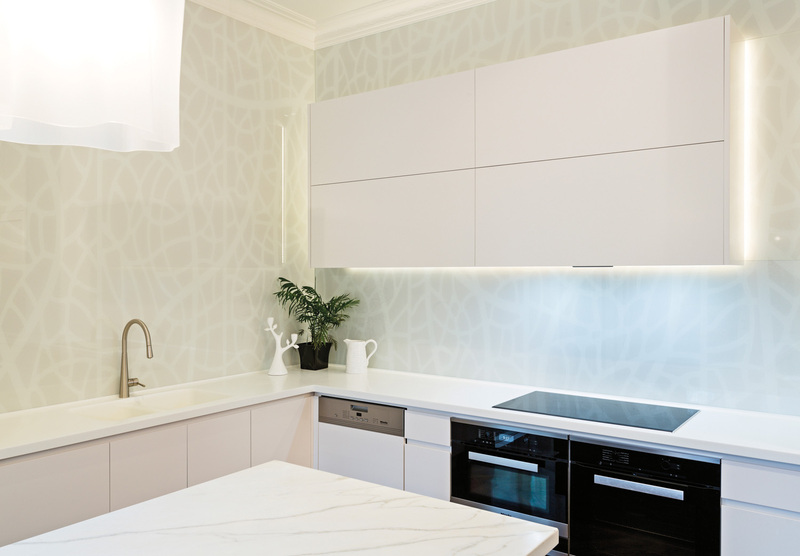 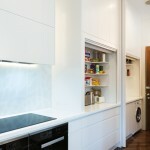 The feature panels were then used for the splashback, reaching all the way to the ceiling. 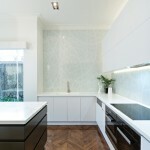 Not only has this personalised the space, but the effect is also interesting and subtle. 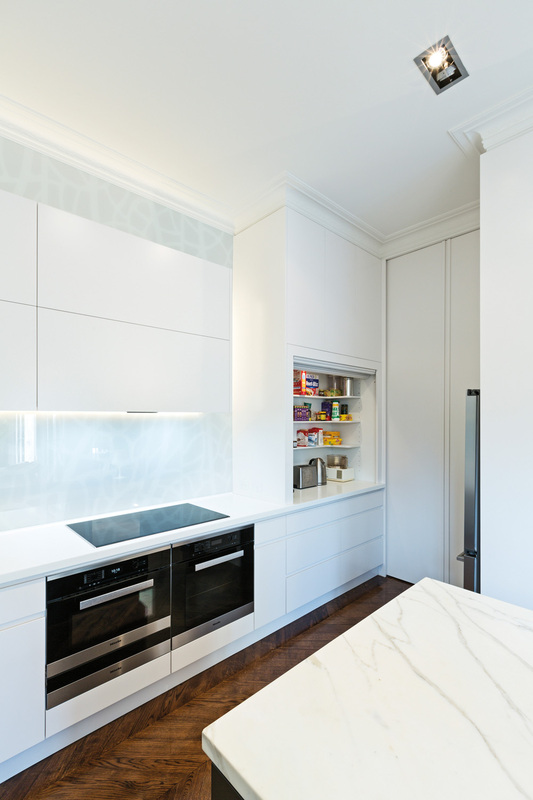 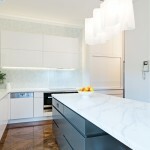 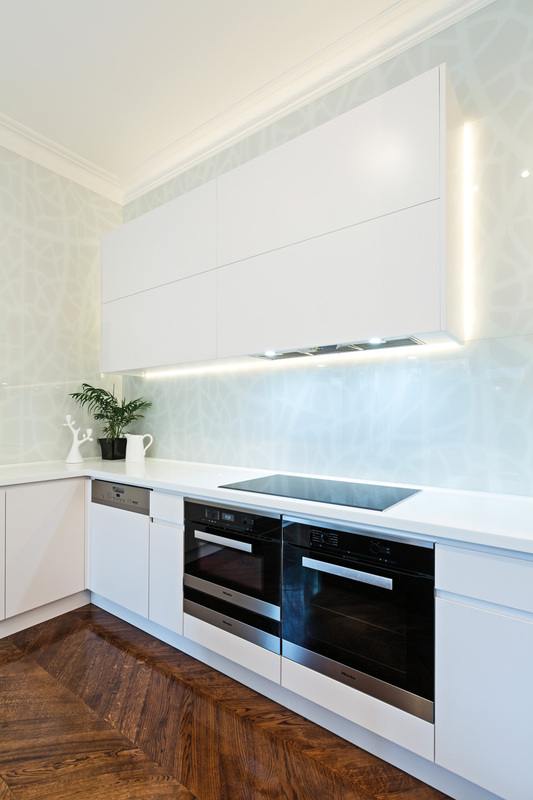 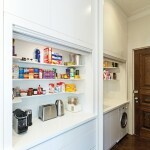 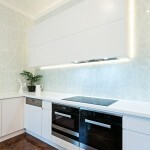 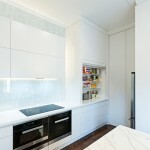 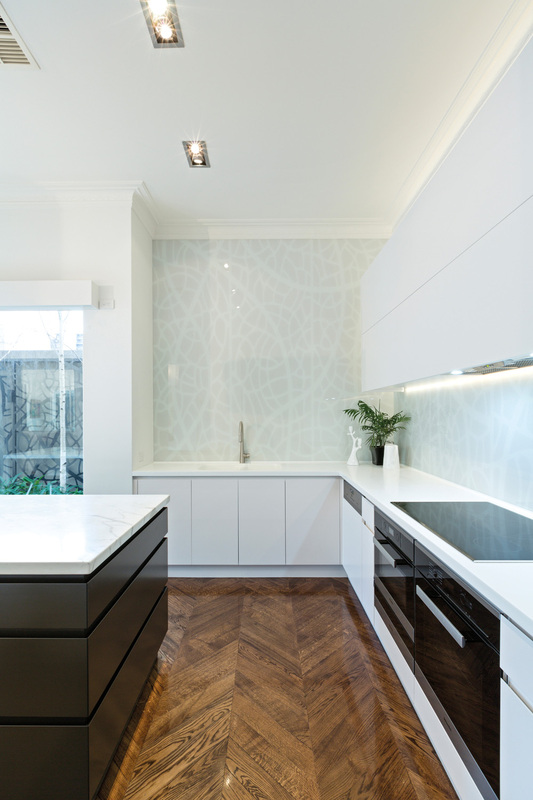 The top cabinets were fitted over the glass panels with LED lighting behind them to reflect onto the glass. 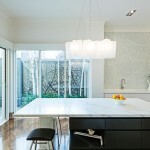 Contrasting other cabinets in the room, the island cabinetry is a graphite colour to inject a different tone.